Squee! It’s the beginning of the fall television season! We’ve already seen Glee take a bow (makes sense, since Fox has fall baseball to schedule around), and the CW comes roaring in tonight to fight for the young, young viewers. In addition to Vampire Diaries, which has already managed to float above the incredibly low bar Twilight set, the season openers of One Tree Hill and Gossip Girl debut tonight. If you’re part of the Gossip Girl audience, you probably had the premiere circled on your calendar–I’ve tried to love it, I really have, but I just can’t get past things like ridiculously colored men’s jackets. One Tree Hill gets less buzz than Gossip Girl, but has Gossip Girl ever had NFL Hall of Famer Jerry Rice as a guest star? Didn’t think so (although it troubles me to think that the young, young people might only know Jerry Rice from Dancing With the Stars). Might have to check out Mr. Rice during halftime of one of the two games inaugurating the Monday Night Football season (Patriots-Bills early, Chargers-Raiders late). One Tree Hill (and Jerry Rice!) at 8pm Eastern and Pacific and Gossip Girl at 9pm, both on the CW; Patriots-Bills at 7pm Eastern and Chargers-Raiders at 10:15pm Eastern, both on ESPN. The new Jay Leno thing that signals NBC’s unwillingness to fight for its life debuts as well, but you can find that yourself if you’re so inclined. We’re not so inclined. There are very, very few people happier than I am that the college football season is finally here. With not one but two alma maters (“Mikaela Has Two Mommies”) flirting with the Top 10, I’m happily settling in with some salsa and a variety of foam fingers for a happy autumn. There have been some good games so far (see ya, Oklahoma. Ha!) and some well-made TV, particularly the cameramen and director who were perfectly on the spot to catch the end of LeGarrette Blount’s college football career. There’s one thing about the lifeblood linking football and television–the advertising–that’s confusing me, though. A horror movie with female protagonists, Sorority Row, opens September 11 and was all over the commercial time during college football. There’s a lot of college football on a lot of channels, and Sorority Row was trundling along to nearly every game. Another horror movie with female protagonists, Jennifer’s Body, opens the following weekend. Frankly, Jennifer’s Body has a better pedigree, what with being written by Oscar-winner Diablo Cody and starring up-and-comer Amanda Seyfried and all (fine–Megan Fox is in it, too). Interestingly, there was not a single commercial for Jennifer’s Body during the copious amounts of college football I consumed yesterday. Different companies are distributing the two movies so it’s impossible to make a direct comparison between the marketing strategies. And maybe there will be more Jennifer’s Body promotion the week it comes out. But I do have to wonder: did 20th Century Fox think that a horror movie–written and directed by women–in which the female lead is doing the killing and the female protagonist has to stop the villain in order to protect the boys might not be as easy a sell to the young male football audience as the movie in which the female leads can be sold as screaming victims? Even if Megan Fox is in it? Could it actually be that so many young men know about Jennifer’s Body because of Megan Fox that there’s no reason to advertise it during football? Inquiring minds would like to know. Both countries show a lot of football. It’s very different kinds of football, but it’s a lot of football. We saw at least pieces of the England-Kazakhstan World Cup qualifying match (and heard no fewer than five Borat jokes within our first hour on the ground as a result), the Germany-Wales game, and the England-Belarus match, and can therefore report that although the graphics leading into and out of breaks are just as mind-numbingly repetitive on British TV as on American, they are slightly less annoying than those break-dancing robots on Fox’s NFL coverage. Advantage: UK. One genre that has disappeared from the American airwaves but that appears to thrive in Britain is the celebrity-stacked game show. The US used to have Match Game and Password (which recently suffered through an aborted comeback attempt) and Hollywood Squares and any number of other shows that were ostensibly about answering questions and winning prizes but that really allowed celebrities to pop off “witty” bon mots. How would Nipsey Russell have disseminated his poetry if not for $10,000 Pyramid? These shows have been pushed off the American television map by fake courtroom shows, but they’re alive and well in UK primetime. We saw one quiz show with Stephen Fry grilling Top Gear’s Jeremy Clarkson (I believe it was QI), and there was Some Guy With A Spiky Mullet who showed up on almost all of these game shows. The peak of such production, however, appeared to be Alan Carr’s Celebrity Ding Dong–I am not making this up–a show that is essentially an electronic version of HORSE. A noted British comedian quizzes teams of B-list celebrities until one team gets four answers right, meaning that their corresponding four letters (either D-I-N-G or D-O-N-G, depending on which side of the stage they’re seated on) have all been lit. They then win some unidentifiable reward–pride? The Crown Jewels? It was difficult to tell. Although we are no fans of the fake courtroom shows, the British celebs’ answers didn’t seem to be scripted and, therefore, tended to be rambling and less than funny. So we’re giving the point to US TV, although we note we might have been more charmed had we any idea who the B-list celebrities were. The US has imported “talent”-based reality shows straight from their Limey cousins–Pop Idol became American Idol; Britain’s Got Talent became America’s Got Talent; Strictly Come Dancing became Dancing with the Stars; Dancing on Ice became Skating with Celebrities. A proud tradition on both sides of the pond. We saw something “talent” based, although we confess we’re not sure which show it was (we think it was probably X Factor, given Simon Cowell’s presence), but it involved a lot of not-very-impressive singers and even a moment where Cowell apologized for picking a boring song for a competitor. Little wonder, then, when we switched on the TV the next night in the middle of yet another singing competition, this one hosted by So You Think You Can Dance‘s Cat Deeley. Finalists included a post-surgical transsexual who had been outed during the course of the show (to even greater public popularity!) and a group act called 2 Up 2 Down, two married couples in which both wives were in wheelchairs. We began to suspect this one to be a spoof when one of the 2 Up 2 Downers tumbled off a stool in which she’d been propped during a number with Rick Astley, of all people–and, indeed, the show was actually a parody dreamed up by Peter Kay (aka Doctor Who‘s Victor Kennedy/Abzorbaloff) called Britain’s Got the Pop Factor…and Possibly a New Celebrity Jesus Christ Soapstar Superstar Strictly on Ice (it’s even funnier when Deeley recites it with great gravity). But I think it says something about the structure of the bread-and-circuses electric kool-aid nightmare these “talent”-based reality shows have become that for 15 full minutes we believed it was real. (In fairness, this was before we heard the title.) Winner: No one (except Peter Kay and Cat Deeley)–we’re all losers in that landscape. So do the Brits actually have superior television? We do love us some Who and Cranford, and we’re grateful they lend us The Office, but we’ve got Daisies and sent them Buffy and The West Wing to great acclaim. I guess we’ll have to keep going back to London until this question is decided once and for all. Oh, NBC, you think you’re so tricky. How could we have possibly guessed who would win the men’s 10m platform diving when you showed us two teenage Americans low in the rankings, two Chinese divers striving to close out their country’s sweep, and a stray Australian? With a mysterious Russian popping up for the last two rounds? How could that possibly end? Kudos, though, for keeping the camera on the Japanese synchronized swimming team as they tried to help a stricken teammate out of the pool, because I swear there was a rescue diver in the water. 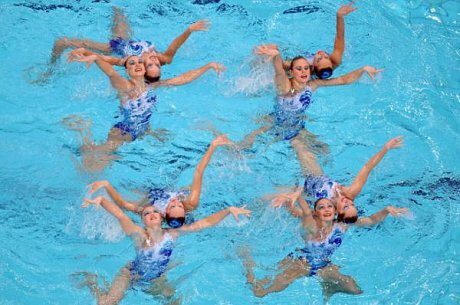 In synchronized swimming. That’s more golden than the medals. Sunday’s Chef’s Special: The euphoria following the Opening Ceremony was quickly deflated when a bizarre and random attack killed a tourist and seriously injured his wife and guide. What a strange coincidence when the victims turned out to be the in-laws of US men’s volleyball coach Hugh McCutcheon, who has exhibited at least as much endurance as the marathon runners in seeing this Olympics through after such a tragedy. His team has responded, making an unlikely run to the gold medal game, which will be broadcast on NBC in primetime (before the Closing Ceremony; spoilers will abound). 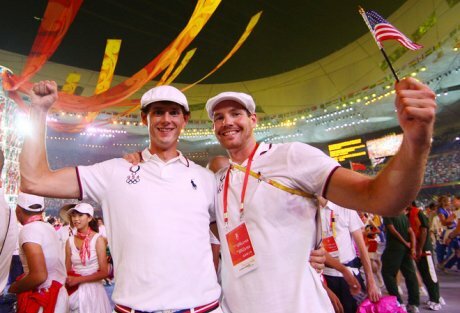 McCutcheon’s wife is 2004 US volleyball Olympian Elisabeth Bachman McCutcheon, and her former teammates rallied to an emotional and unexpected silver medal. McCutcheon’s own team is guaranteed at least the same, and whether they take home that or the gold, their perseverance is emblematic of the determination and spirit of all the athletes we’ve enjoyed through the last weeks. Those athletes will be banking all of that will for the next four years–and we’ll be back to watch them. Saturday’s Blue Plate Special: The aforementoned Wariner and Neville are joined by gold medalist LaShawn Merritt in the finals of the men’s 4x400m relay (the women’s race is contested today, too). Since the baton passes in the longer relay aren’t blind passes, the drama comes from the running instead of the butterfingers (the heavily-favored Jamaican women were the latest to cough up the stick in the 4x100m; Usain Bolt, however, is made of gold and therefore magnetic, so the Jamaican men were okay). As is tradition, the 4×400 races are the last of the meet, so there should be a party atmosphere in the air (unless International Olympic Committee president Jacques Rogge is around, as he apparently hates parties). Saturday’s Chef’s Special: Since I’m not very bright and can’t read a schedule, we missed mentioning whitewater kayak and canoe (which meant not only missing the neat event where people have to change direction while drowning to paddle upstream but also missing Togo’s first Olympic medal). We’re on top of the last medals awarded in the flatwater events, however. “Paddle” sounds kind of quaint and adorable, but the quad teams move so fast they could pull a water skiier behind them. That’s…possibly not human. The “sprints” (500m) in doubles and singles for both canoe and kayak will be broadcast today, and while the solo and partner boats don’t fly quite as fast as the quads, they undoubtedly feel the burn. Daytime on NBC; the Olympic coverage goes most of the day, so you may have to keep checking in. NBC’s sideline interviews haven’t been outstanding–Andrea Kremer putting an awkward hand on weeping 15-year-old diver Haley Ishimatsu‘s shoulder after Ishimatsu didn’t qualify for the 10m platform finals was a low point–but the live interviews at the Bird’s Nest provided a couple of moments today that give a glimmer of hope. The interview immediately after the US women’s 4X100m relay team dropped the baton led to a still-panting Lauryn Williams claiming that someone must have a voodoo doll with “USA” on it, an amusing distraction from the unfortunate result. And while I am one who tends to roll my eyes when an athlete drags God into their victory (what, God hates your opponent? Leave God alone), the interview immediately after the 200m race allowed Allyson Felix, disappointed silver medalist and daughter of a preacher man, to direct some thanks heavenward after she lost. This refreshing change of pace makes us wonder if there might be a point to the sideline reporters after all. Friday’s Blue Plate Special: A lot of superlatives get tossed around in sport (why is The World’s Fastest Man the guy who wins the 100m instead of the one who wins the 10,000m? ); tonight you can see the guy they’ll call The World’s Greatest Athlete, the winner of the decathlon, crowned. What makes an athlete “the greatest” is open to debate, but the decathletes are pretty darned impressive, having to demonstrate remarkable speed (100m, 400m, 110m hurdles), hops (long jump and high jump), strength and technique (pole vault, javelin, discus, and shot put), and endurance (capping it all with a 1500m run). Reigning world indoor champion Bryan Clay is favored for gold but will have to hold off the only man ever to break 9,000 points in the decathlon, Athens silver medalist and defending Olympic champion Roman Sebrle. Sebrle also just happened to be skewered by a javelin during training last year. Can you imagine being the poor javelin thrower who pinned The World’s Greatest Athlete? See how Sebrle has recovered, and how he, Clay, and others battle it out, noon (EDT) and in primetime on NBC (spoilers could hit you in the shoulder). Friday’s Chef’s Special: Turn the decathlon upside down with the modern pentathlon. The founder of the modern Olympics started the modern pentathlon to create the perfect athlete, balancing physical and moral superiority. Why this sport would be more moral than any of the others (take that, basketball rapscallions!) is unclear, but it does require a broad and impressive skill set. Rather than throwing or jumping over things, pentathletes shoot pistols, fence, swim 200m, show jump pretty horsies, and run 3K. You can see how the modern pentathlon nicely updates the ancient one, trading hand-to-hand combat skills for more tehcnologically based bloodletting. While it has a military history, it screams dueling to me, so I am dying to see if anyone slaps a rival with a glove. The women’s competition can be found on USA Network at noon EDT. Thank goodness there weren’t any sports being contested at the Olympics today so NBC could show the “Champions’ Gala” gymnastics musicale revue in which absolutely no medals were awarded. In other news, Usain Bolt is awesome. In fairness, so were NBC and commentator Ato Boldon in untangling the disqualifications in the men’s 200m and capturing the moment when Walter Dix was told he had medaled. And, to be further fair, they did finally talk about Natalie du Toit and my favorite Olympic victor so far, super heavyweight weightlifter Matthias Steiner, so points added back. Thursday’s Blue Plate Special: NBC will probably try to sell you on the idea that the compelling story in the women’s 10m platform diving competition is 30-year-old Sydney gold medalist Laura Wilkinson and whether she can reach the podium in her third Olympics. I’d argue the more compelling story is whether China can sweep the gold medals in the diving events. Only the individual platform events remain in their way, but a Chinese diver hasn’t won the women’s Olympic platform gold since the great Fu Mingxia repeated in Atlanta. The Chinese hopes this time are pinned on 15- and 16-year-old athletes who weigh less than 65 pounds each–will they come through, or overrotate buckle with the eyes of a nation on them? Primetime on NBC (spoilage is possible). Thursday’s Chef’s Special: It’s easy to make fun of rhythmic gymnastics–see below, if you dare to think of Matt Lauer, Al Roker, and Brian Williams in spandex–and the waving a little ribbon around doesn’t help. But if you actually watch the sport for a few minutes, it becomes clear that rhythmic requires not only incredible flexibility (perhaps more than any other athletes here) but the kind of hand-eye coordination found in the great shooters, archers, and badminton and table tennis players who have competed here. Try shooting an arrow or hitting a birdie with your leg pulled so far up over your head your foot touches your nose. It’s hard work, and you can see it from 1-2pm on NBC. I have accused Olympic coverage in the past–which has meant NBC recently–of spending too little time covering sports and too much time doing sob stories, with sun-dappled athletes who have overcome the heartbreak of hangnails staring pensively into the distance. There seems to be less of that in this year’s coverage (although possibly more on the athletes’ dogs), but I’m kind of astounded at the missed opportunities. I’ve been waiting for 10 days to bring up marathon swimming because of South Africa’s Natalie du Toit, who is the first amputee to compete in both the Olympics and Paralympics. If you’re up noodling around the second this is posted, you might catch the few minutes of latenight USA Network coverage of her event. Similary, I’d have thought NBC would be all over the story of Henry Cejudo, child of dirt-poor immigrants who never had his own bed before he moved to the Olympic Training Center and who just won a shocking gold in freestyle wrestling. Who would ever have dreamed I’d be begging NBC for more sun-dappled moments? Wednesday’s Blue Plate Special: I’m a little torn on beach volleyball (although, given the amount of coverage they’ve given it, NBC clearly isn’t). On one hand, just the idea of only two athletes covering an entire court is astounding, and watching the “traditional” volleyball serves and spikes being performed by people slogging through sand is pretty impressive. On the other hand, the skimpy bikinis hurt me in my feminism (why aren’t the male players in Speedos?). It did help when one of the finalist teams had their country abbreviation at key places on their uniforms, though–thank you, Brazil. Coverage of the women’s gold-medal match on primetime on NBC (beware spoilers). Wednesday’s Chef’s Special: NBC has been doing a lot of crowing about the high ratings they’ve gotten so far in these games (call it the Phelps Effect), and you have to think the IOC is happy to make the networks happy, since they get such a yooge percentage of their operating budget through TV. So perhaps it is no surprise they’ve taken a turn toward the X Games demographic, introducing BMX to the Olympic program this year. I have to admit I know next to nothing about BMX racing, but hearing it described as “a full-contact bike race with jumps” makes me want to know more. NBC covers both the men’s and the women’s finals in primetime (spoilers will be available). I’m not sure what I think about his histrionics in terms of sport, but since NBC is a fourth-place network, I just don’t think they have anything to lose by putting Bela Karolyi in his own reality show. Possibly with subtitles. Tuesday’s Blue Plate Special: The men’s 110m hurdles competition has turned out to be a heartbreaker (damn you, Lane 2! ), but the women’s version still has L-O-L-O Lolo. Lolo Jones has gone from living in a church basement as a kid because her mom couldn’t afford rent to being in the running for a gold medal in Beijing. Given that she has the audacity not only to call her website runlolorun.com but to have “Whatever Lola [ahem!] Wants” play when you visit, I’m essentially forced to root for her. She’s joined by two more Americans (Damu Cherry and Dawn Harper), two Jamaicans (Delloreen Ennis-London and Brigitte Foster-Hylton), and three additonal runners from the Commonwealth (Canadian Priscilla Lopes-Schliep, Aussie Sally McLellan, and Brit Sarah Claxton) for the “Sun Never Sets on the Hurdlers of the British Empire” race. Shown on NBC in primetime; beware spoilers. Tuesday’s Chef’s Special: Weightlifting comes to a close today with the men’s super heavyweights (231+ pounds). These are big boys, and they sometimes get written off, I think, as just being behemoths who throw weights around with their giant, stump-like arms. They’re a lot more than that–the jumping ability necessary to execute the clean and jerk often translates into ridiculous vertical leaps. Vertical leaps of three to three-and-a-half feet kind of vertical leap, which puts the weightlifters in the same category as the NBA players competing in the basketball competition. No, seriously. Watch and be astounded, early morning EDT on MSNBC.